How can this athlete improve her catch position in the power clean? Alternate stance for each rep.
"Why Women Can't Do Pull-Ups" by Tara Parker-Pope, The New York Times Magazine. Chuck Carswell 2:46, Andy Bayles 2:56, Leah Polaski 3:06 (198lbs). Level 1 Certificate Courses: CrossFit Max Effort, CrossFit Reston, Alamo CrossFit, River North CrossFit, CrossFit X Factor, Peak 360 Fitness, CrossFit Southie, CrossFit Atlanta, CrossFit NYC, CrossFit USD, CrossFit Park City, CrossFit Stockport, Patrick Air Force Base. CrossFit Kids Course: CrossFit Morristown. "A group of service members, Army, Navy, Marines, Air Force and NATO forces, gathered on October 6, 2012 at Kandahar AirField Base in Afghanistan in honor of all the fallen comrades and completed the 'Del' Hero WOD in an effort to raise money for the Ranger Foundation. 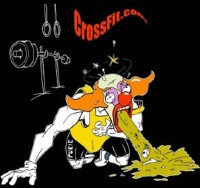 CrossFit Kandahar was proud to host the event." CrossFit Lake Charles South, Lake Charles, LA. Paul Wagner's home gym, Amman, Jordan. Team U.S.A. at the CrossFit Invitational, presented by Reebok. The 2012 Reebok CrossFit Games continues on ESPN2 tonight starting at 8pm ET. Tisara, Shenal, and Shenuka, Sri Lanka. CrossFit Level 1 Certificate Courses: Peak 360 Fitness, Rogue Fitness, CrossFit Strong, CrossFit Park City, CrossFit Milford, CrossFit Ethos, CrossFit Atlanta, CrossFit Scottsdale, Norcal CrossFit, CrossFit Vancouver, CrossFit Twente, CrossFit Revolution X, CrossFit Spangdahlem. CrossFit Coach's Prep Course: Rainier CrossFit. CrossFit Kids Course: Trident CrossFit. Megan Finn and Stacy Vinz. Just another early morning at BU CrossFit. If this position unladen is reasonably safe, are there detriments or benefits to training this way?